Hold on to your hats! We're thrilled to be showcasing a new ombre building stamp set that you're just going to LOVE! Use this by itself or with just about any stamp set you already have in your collection, to create amazingly stylish and colorful creations! This collection of 3-1/2" wide patterned borders allows you to stamp several in a row using a variety of colors to build an ombre look. You can even do some generational stamping with them for further looks. As always, you can use these for more than just ombre building as well. They also work as borders, a sentiment accent or even as frame elements. Ombre Builders will be available for purchase on June 15th. Ombre Builders contains a total of 13 images. Each of the patterned strips measures 3-1/2" wide and between 1/2" to 1" tall. Now that I've made the formal introduction, let's get started! For my first project I used this banner looking border to create several rows that underline my sentiment. I used Limeade Ice, Orange Zest, Hawaiian Shores, Hibiscus Burst and Summer Sunrise to stamp the banners in a column. The dotted line border from No Strings Attached was just the perfect thing to add a little stitching detail to the top edge of each row. I simply masked off either side with post-it notes and then stamped the stitching in one shade darker. The banners give kind of a whimsical look, so I selected a sentiment from the new Thank You Kindly that complements that style. It was stamped in True Black. Super, super easy card that you could easily mass produce! This card uses a bold three-stripe border that is one of my favorites! I wanted to show how you can fill nearly an entire cover with repeating borders and get a very dramatic look. I used generation stamping with each color to help blend the rows and give it a softer look. Aqua Mist, Hawaiian Shores, Winter Wisteria, Limeade Ice and Simply Chartreuse are the colors I selected for this. Note that I slightly overlapped each color to help them blend even further. This gorgeous sentiment from Friendly Flowers was the perfect things to accent the corner, stamped in True Black. I wanted to do something completely different with my next project so I opted to use Classic Kraft as my card base and make a more masculine looking card. 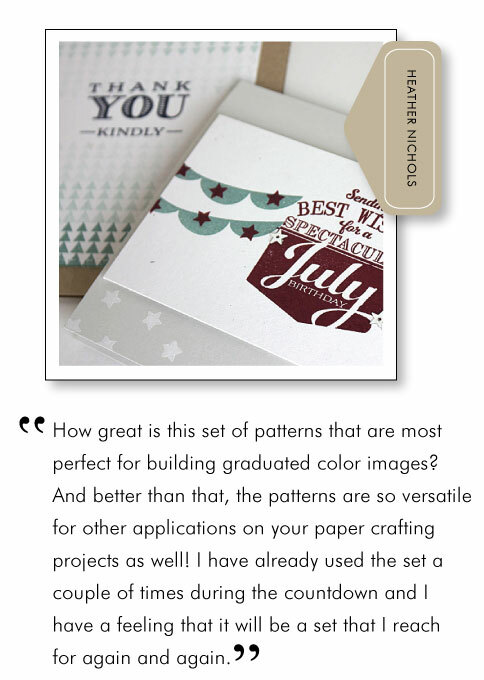 This also shows how you can layer more than one of these pattern strips for even more design opportunities! I stamped the solid stripes first using Orange Zest, Ripe Avocado, Ocean Tides, Terracotta Tile, Melon Berry and Summer Sunrise. I overlapped the stripes slightly and staggered them on the left side for a more random look. I then used this beautifully detailed stitching stripe that has multiple rows of stitching all in one stamp. This was added on top of each block of color in Fresh Snow. 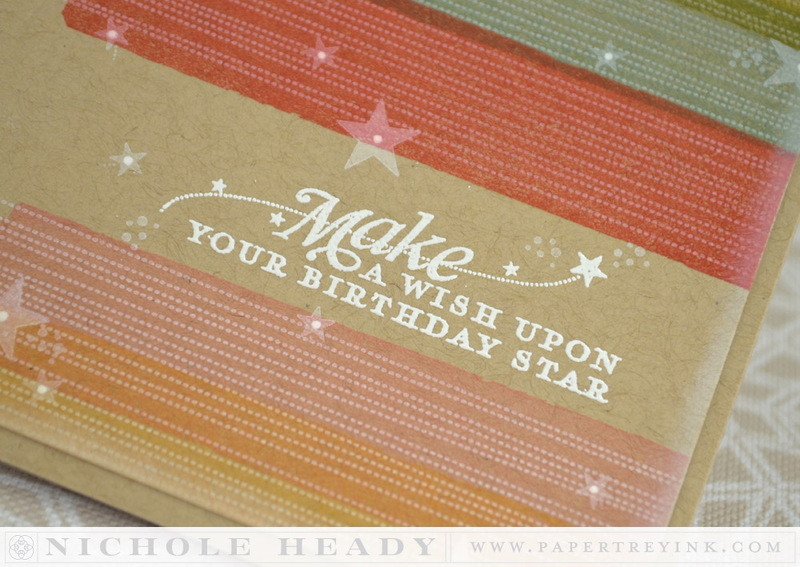 The sentiment from Star Gazer Additions was added with VersaMark ink and heat embossed. I then scattered a few of the small star images from the set across the card cover, adding a small dot with the white gel pen in the center of each. I swiped the Fresh Snow ink pad around the edge of the card front and adhered it to a Classic Kraft card base. My last project shows how you don't necessarily have to line the patterned strips up in perfect rows, here I have created a bit of a basket weave look. I stamped the strips in Harvest Gold, Limeade Ice and New Leaf, three horizontally and three vertically. I was then able to add this sweet sentiment from Doodlie-do in True Black where the strips intersect. I created my own glossy dots by punching New Leaf cardstock and coating th epieces with Glossy Accents. I hope you have enjoyed all these amazing creations that both the team and I have shared with you today! Are your creative wheels turning with ideas for how you plan to use this set yourself? Is there a certain pattern or technique you just can't wait to try out? We would love to hear your initial thoughts on everything we introduced! Please leave a comment on this post to tell us what you think of the new products and you will be eligible to win big! You have until 7am EST, June 14th to leave your comment and be eligible to win. Only one comment per person please. One randomly selected winner will be announced on our June Release Winners Page before noon EST the same day. Thank you for stopping by today and best of luck with the contest! Such creativity; you always blow me away DT ladies. Love ombré – it’s so close to rainbow – my favorite! Oh yes! This set looks like it will be so much fun to use. Fantastic stamp set and inspiring projects from all! Ah, a cool new idea. Looks great. Soooo pretty! Love the different patterns I’m seeing! Can’t wait to see all the shapes! Gorgeous rainbows and so many possibilities with these stamps! Cool! Love that there are so many patterns in this set- so many ways to use it are coming to mind! Wow! This is a “gotta have” set! Love all your wonderful, colorful projects, ladies! Wow! I LOVE the ombré stamps! A simple concept beautifully executed! I will definitely look at ombre in a whole new light! Great projects Design Team! 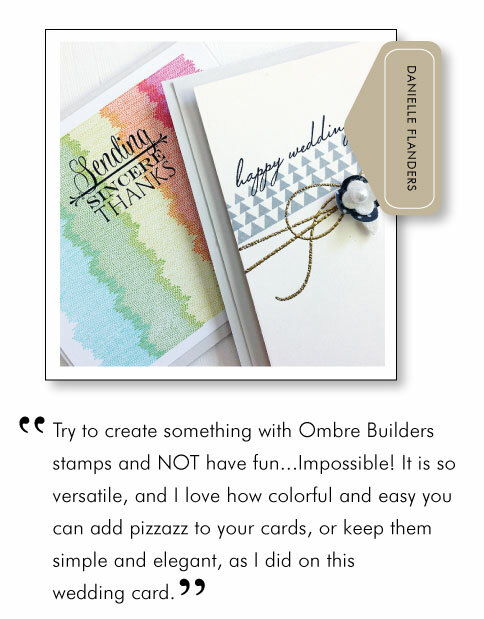 Ombre Builder looks like tons of fun!! Wow, what inspiring projects! Can’t wait to see the full reveal of the Ombre Builders set. I’m a one-layer kinda stamper; Ombre Builder will definitely help me take it up a notch! Very on trend for sure! Love the possibilities…they seem endless! These are so cool and so fun! My favourite are the triangles and the stripes! Love the cards which everyone made!! What a fun and versatile set! Ombre – now I get it! So this is what all the fuss is about. Just beautiful execution by the entire DT! Loving this new set, so many possibilities! Adorable and colorful projects- love the ombré! Lovely, but I would prefer ones that are at least 5.75 inches long so they go all the way across many different size card bases! Wow! This is gorgeous 🙂 Love the ombre effect. So versitale. Those are really cool! I love how you can mix them! The Ombre Builder looks like a great staple. So many possibilities with the Ombre Builder set! I love it! This set looks fun and versatile! The DT does such a great job. This ombre set would be fun to have! Kind of think I have to order this one for sure. great projects,need to add this set to the list! I am seeing this trending effect every where. Wonderful! Awesome set! I really love the versatility of this one. These all look like so much fun to stamp. Lots of possibilities! Such fun patterns. 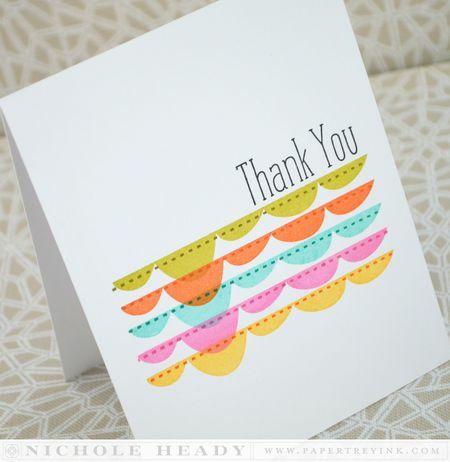 A great stamping basic! Thanks for the inspiration. Ombre Builder is my favorite stamp set this month ( so far!). Getting this one for sure! The ombre builder is so neat! WOW! Adorable set, lots of possibilities! Wow, your cards all look fantastic! What a cool set! I like this soo much! Love love love your cards! Wow! Such a basic set but so versatile. An amazing amount of things can be done with this set. Perfect for CAS cards. WOW, this set was made for me. LOVE how versatile it is and the color possibilities are wonderful! I love ombre. It is so versatile. Color is my latest stamp rage! What fun and colorful projects today! The Ombre Builder set is so versatile. Loved everything! Two thoughts struck me as I scrolled through today’s wonderful cards: 1. Lots of CAS cards and 2. Lots of cards suitable for the guys in our lives (always a challenge!) The Ombre Builder has so many possibilities! Fantastic stamp set! Beautiful projects made with it . This looks like an incredibly useful stamp set to have – and looks like a lot of fun to use too! Brilliant! The Ombre Builder set is on my list! Love the design team projects. What a clever and up unique idea! Love Ombré Builder! Gonna be so much fun to use!! Awesome ombre builders! Lovely cards and ideas. What an awesome and versatile set! Love it! Themen ombre stamp set is fantastic. I love all the project with it. Ombre is one of my favorite things right now! I’m so excited for this stamp set! It’s FABULOUS! So many great ideas! Love the ombre builder set! 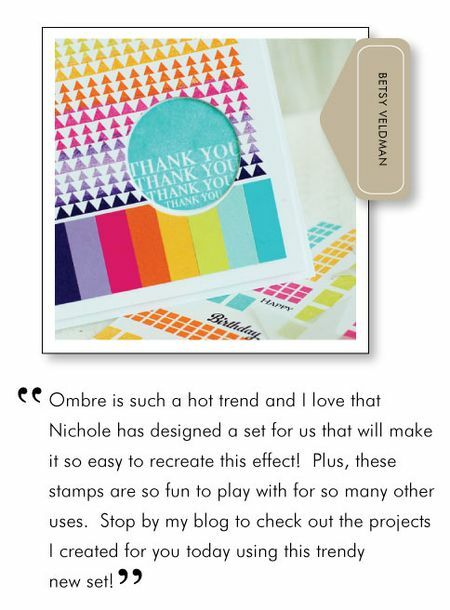 So excited about the Ombré Builder stamps! Loved the cards today especially Laurie’s card using an Ombré strip as little hills! So cute! The variety presented by the team is perfect for so many occasions. I love the versatility. Wow! So many possiblities with the Ombre set. Love it. Oh – so many possibilities with this set. Just beautiful! I love this set and what the DT has done with it. Great way to incorporate ombre and rainbows….my favorites. Ombre Builder is ANOTHER one of those foundational stamps sets that can be used for a multitude of uses. So many possibilities with the Ombre Builder. Definitely need to add to my “must-have” list for this release!! I really love that ombre effect, great projects. Wow…. the Ombre Builder projects are amazing-and play oh so nicely with all of the other new stamps! I love all the sets this month! Ombre is a little tricky to do but you (as usual) have found a way to make it easy! I think I just stumbled upon another PTI must have. Oh the possibilities! Ombré is just too cool. Ah! Color! It makes any card more beautiful! Ombre Builders is such a brilliant set! My mind is spinning with ideas and color combos to try. I can’t wait to get this set!! The Ombre Builder looks like a must have with endless possibilities! Wonderful! What fun looks with wonderful colors! Each card is so unique! The ombre builders look so fun and versatile! Oh, this looks like a must-have set! Can’t WAIT to see it revealed!! And, as always, GREAT ideas from your designers! This set looks amazing. I love how many different stamps in it there are. Very nice….this ombré set is a must have. The cards are fantastic!!!! Oooh, ombre! I’m excited and intrigued! I love that you’ve created so many patterns to blend and contrast. What a fun set! Beautiful cards! I love looking at all of the projects/cards from the dt each month. What fun these will be to play with – so versatile! Great cards by you all! Oh my goodness! You gals put the fun back in stamping with Ombre Builder! Love these projects, so trendy and artsy, just perfect!!! Wow, great idea and much needed tool. Thanks for the wonderful inspiration. Wow!! The ombre builder is so cool!! I love all the different patterns- there are so many things you can do them!! Awesome! I need this set! Gorgeous samples from the DT! This is a fabulous set! Can’t wait to see the whole thing on reveal day! Oh how fun!!! I love that they can be used for an ombre look . . . or not! Together . . . or not. Great new stamp set. I love the ombre look! And now it will be easier to create. Love the Ombre Builder, especially Melissa’s banners. Just like wash tape!!! It will be a must have set. Ombre builder is super! So versatile and trendy at the same time. Love all the projects-can’t even single out a favorite cuz they are all great. This new Ombre Builder set looks like a lot of fun to use. I love all the different ways the design team used them – so clever! Great cards by all! Ombre Builders will be a must on my order this month! I love all the beautiful cards you created with this set. Very interesting set. I really like the last card with the basket weave pattern. What an awesome set.. Perfect for clean and simple (and fast) cards! I love it!!!! These look amazing and all the examples are testament to how versatile this set will be – YAY! Must. . . have. . . Ombre Builders!!!!! Amazing new set today! My mind is spinning with the possibilities. Super excited to get this one home! This Ombre Builder set is really versatile and can be used in so many ways. Wonderful card samples! I really like the concept of this new set. Very clever. Looks like a very fun set! Great samples! That ombre looks like so much fun! Would be great paired up with all different sentiments…. What a great set…so fun and versatile. The ladies outdid themselves today..really fun cards. Way to go! I really do like the ombré trend and the team blew this one away! Such amazing, beautiful projects! The Ombré Builder looks like a must have for creating spectacular looks! Oh wow! Love these borders. It’s going to be really hard to choose what to buy this month and stay in my budget. The ombre builder just mase me happy!!! A must have for me!!! The Ombre Builders are cool, and pairing them with the new Thank You Kindly set adds many ways to make beautiful thank you cards. I want these! Beautiful cards as usual…Love everything. Versatile AND trendy – can’t beat that! Looking like a ton of fun! So many options with this set! Great projects. Thanks for sharing. Very versatile set! Wonderful set and projects! Wow! So much creativity! I love some of the stamped images I saw. Love the Ombre look & it’s so popular right now. It’s great that you can fill the whole card front. What a great seat.Ombré builders gives endless options for backgrounds.love it! Wow, love the set with so much variety. Looking forward to seeing Ombre Builder in real life! Love the look it creates…so fresh. Fun ombre set and great DT samples. LOVE Ombre Builder! The designers always blow me away with their fabulous inspiration! Love the variety of designs in Ombre Builder. So many options, which is a BIG plus. Great projects too. Thanks to all for another super release! Love it. 😉 This Ombre set looks very, very fun. I love the variety of DT projects showcasing it. Looks like a ‘must have’! Can not WAIT to buy this set! I just adore ombre effects and I love even more what Laura Bassen did with the set. I also can’t wait to buy the wet paint die cuts, these are just fab. Love the new stamps today. What a variety of ways to use them. Great cards. Love this set! I also love how everyone used it! Got to have it! Wow! I never thought I could “do” the fun and great-looking ombre trend….until now!! Makes ombre designing look easy. Like!!! Lots of possibilities and once again, lots of inspiration! These would be so much fun to use as borders on journaling cards and 4×6 cards for scrapbooking as well as all of the fun card ideas from the team. Beautiful samples made with Ombré Builder!! I love this set…looks like a fun one to play with!! Gorgeous! Oh the possibilities with the ombré builder. Tres cool! Stunning cards by everyone! So many inspiring creations!! Love ombre! Great Samples. Looks like a great background builder! Fabulous! Love the stringy stamp that Laura and Laurie used. I love the variety of ways the design team used the ombré set. Very intriguing! The ombré builders set looks to be very versatile! Love the beautiful cards and creative ideas. 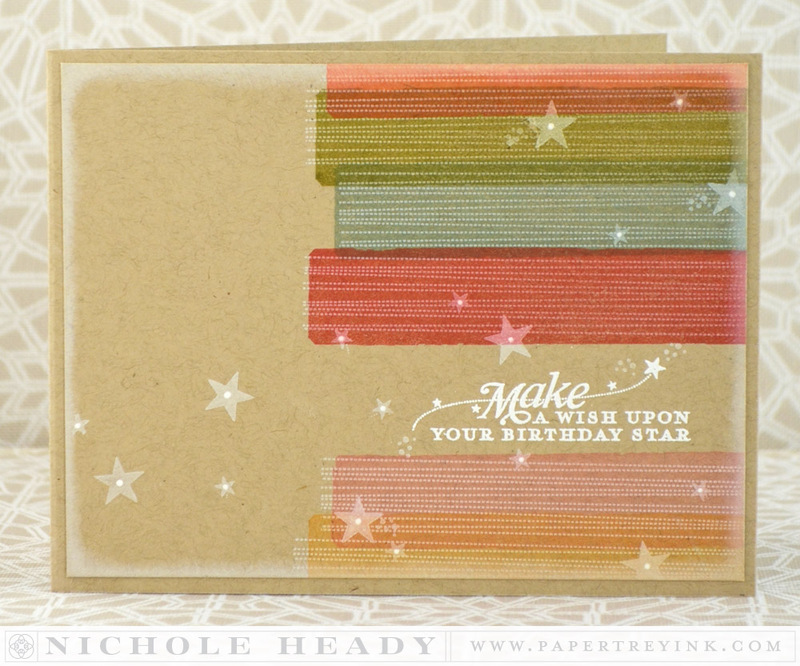 Beautiful cards with the new Ombre Builder stamps! My favorite is the first Thank You card with the ombre banners! Great examples of the ombre set options. Wasn’t sure what to think about this idea during the peeks but I really like it! The uneven scalloped is my favorite. The ombre builder is a fantastic idea. Very versatile stamp set. Lovely samples today, Ladies! I love how versatile this set is! I love that each of the stamps has such a distinct feel! What a great stamp set! You can do so much with this, can’t wait! Wonderful background builder stamps! I have an “Ombre” board on Pinterst — love that look. This looks like a really fun set! I love the samples from the DT. Especially the fuzzy block with rainbow colours overlapped. So fun! this is going to be a great go-to set, I can tell! Love the variety of stamps for creating an ombre effdct! Ombre Builder looks like fun. Thanks for the great samples. Beautiful! This Ombre Builder is a must have, what a cool effect!Love it! So many ideas today! Looks like another great release! Very interesting and I love the colors!! I’m loving it! So pretty. So colorful. Love the cards created with this new set. What a creative and fun set! OMG! This is sooooo cool! You have an amazing and super talented team! Wonderful projects from all the ladies! 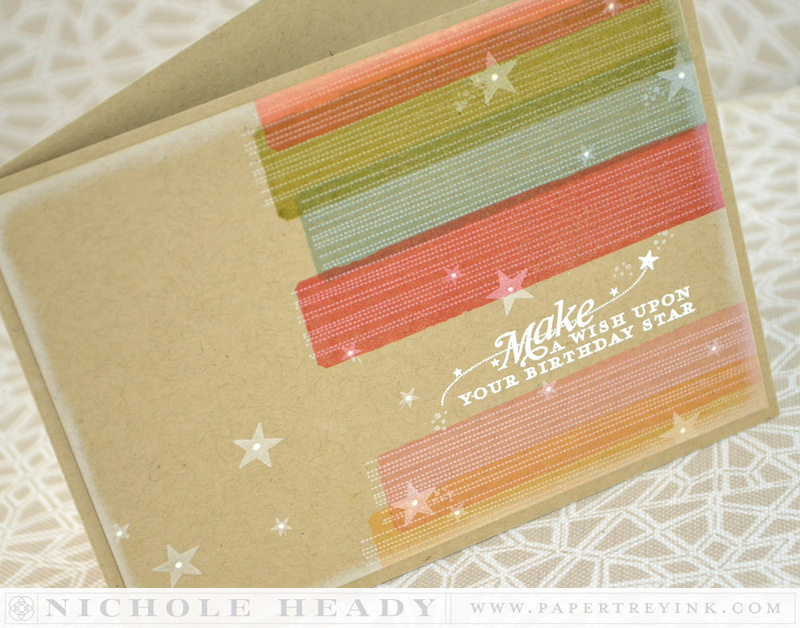 Ombre Builder–what a versatile stamp set. 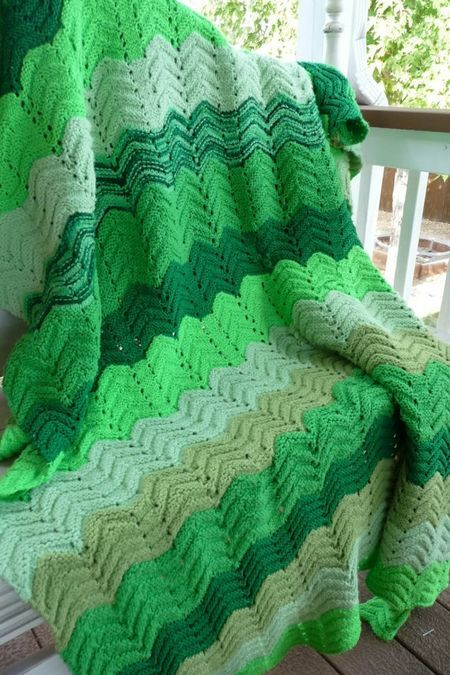 I crochet ripple afghans so I’m in! Love the examples from the team and thanks for a chance to win! Ombre Builder will turn into a ‘must have’! Great job on the samples too! Love the Ombre Builder stamp set, so many things to try!! Great go to stamp set! This set is absolutely brilliant! It’s definitely going in my shopping cart. Sweet! Love ombre art . This is just what I was looking for ! cant wait ! I’m so glad to have your design team to inspire me every month. Other companies can’t compare! My husband doesn’t “get it” (as most men wouldn’t) but he encourages me and loves it when I get new “goodies” from Papertrey. Looks like this month is going to be another much-anticipated box in the mail! Ombre Builders looks like such a fun set! Spectacular cards from everyone, again. So many possibilities! Love that I will be able to create one layer cards so easily. Ombre Builders is such a great set for the one layer cards. Great projects done today with this set. Lovin’ the borders. I am a border fanatic! The ombré set is so versatile and looks like so much fun to use! The Ombre Builder stamps will be so much fun. Awww… there are so beautiful with the ombre effect! I love how you showcased Ombre Builder so many different ways!! Looks like a must have! Love all of the fabulous ideas for using Ombre Builder! Wonderful job DT! Lots of different uses for this set. Love it! 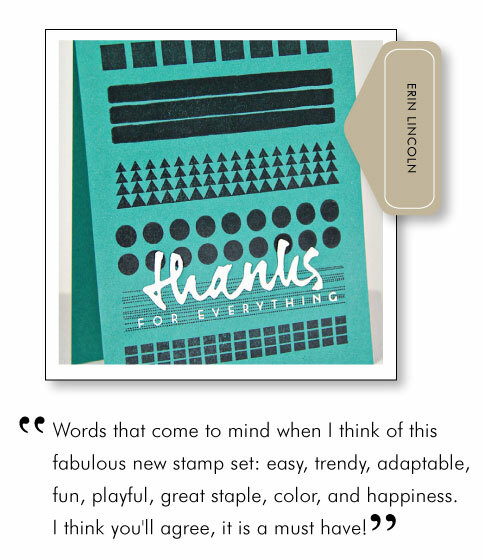 Love,love, love the ombre stamps. What wonderful samples your talented designers made with them. I can hardly wait until they are available to purchase. Thank you so much for coming up with this gorgeous and versatile set. Ombre has taken over the world & I kinda love it! Nice variety of patterns in this set. You & the DT made some great cards w/it. these are all so neat. impossible to choose just 1. 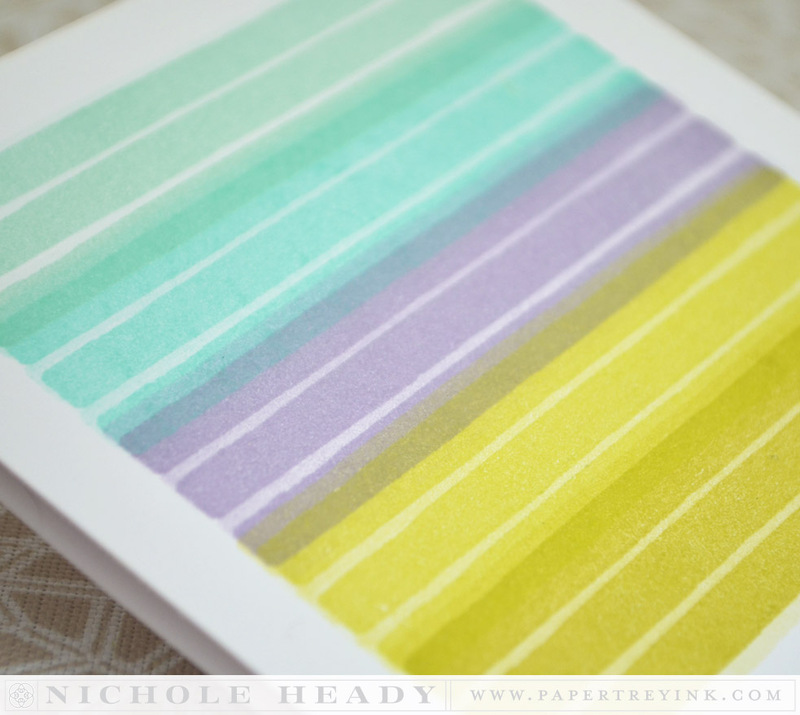 Really beautiful cards…lovin’ this ombre trend! Thanks for making it so easy to make great, on trend cards! The DT ladies do it again–make me want it all. So many options with this set! Love it! I really love the Ombre Builder concept and your projects!! This is perfect for CAS cards which are my favorite. Would love to win this for my wife; she is a PTI fanatic. Awesome set ~ more than I expected! Wow wow wow wow wow, one wow for each line of the ombre lol!! You’ve outdone yourself with this stamp set, Nichole, this is totally my style and it WILL be in my cart on release night!! Cannot wait to create with this months products!!! Love all the color! Looks like fun. Loved Danielle’s elegant wedding card with the No Strings Attached! Very interesting! Lovely projects, thanks for sharing. 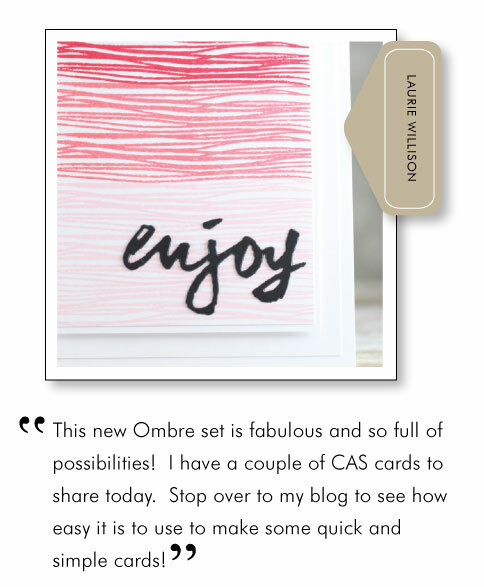 Fun ideas for the new trendy ombre stamp set! What cool and amazing products and projects. Just WOW! This looks like so much fun! Ooohhh!!! The Ombre stamps look so wonderful! Great cards and what inspiration! Lots of options with Ombre Builder! Love your samples! i love this set! i especially like that they can overlap & don’t have to line up straight. thanks. Brilliant!! I adore the hombre. Another terrific release! Fun set! So many ways to use it! Great inspiration from the entire team! Love this technique. All of the cards are fantastic. Love them all. thanks for sharing. Very cute!! Can definitely find lots to do with these new releases! Love the banner! I think everyone summed this set up perfectly, it is so versatile and creative. Everyone will love this set. Oh, I love all things ombré! What lovely cards for this release! OMG-Ombre Builder is awesome. I can’t wait to play with that set. Wow! This is my first time on your blog. these are beautiful. I love the ombre! Neat shapes. Love the way you can build your background with them. Ombre Builder – looks like fun!! How have we been crafting without this ombré set? 🙂 Thanks for designing this set, Nichole! I can’t wait to play with it! Love this set. So many possibilities . Love the Wet Paint dies and all the bright and colorful selections today. Ombre Builder is right up my alley! Love these versatile sets for endless possibilities. Can’t wait! I <3 Ombre! It's such a fun way to use color! How fun! Can’t wait to try this set! Love the Ombre Builders set. The projects today were so pretty using them. Thanks for the inspiration. I’m not a huge fan of the ombre look but I love all the borders. Can’t wait to see what the full set looks like. Really looking forward to the ombre builder set– I’d love to be making more single layer cards. Soooo many different ways to use the ombré set, love the versatility. Ooooh, an ombre bandwagon that I could jump on! Fantastic new set. Wow… great cards. I just love this ombre builder set. 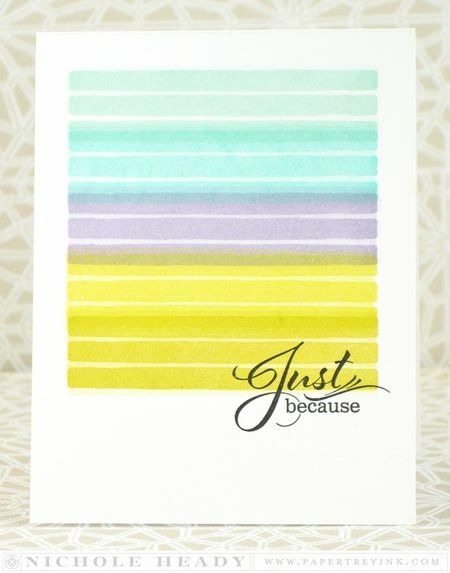 Love the ombre stamps, so many possibilities!! Happy Friday the 13th to everyone…this set looks like it holds endless possibilities! I especially love the pattern that looks like layered strings. Love the banner and triangle borders! Thanks so much! All the cards from you and the team are amazing! Just shows that the possibilities are endless! 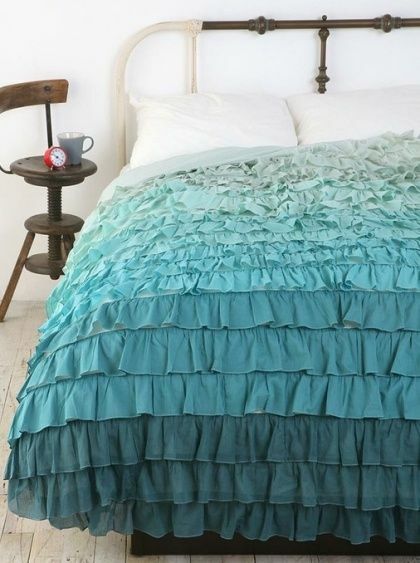 I love the bedding inspiration!! Gorgeous cards!! Wow, this set is chock-full of patterns! The most amazing stamp set…..EVER. I am definitely getting this one. WOW!!! the ombre builder is on my wishlist. The cards example is so amazing!! What a great set. I love the ombré effect on everything. At first I didn’t think I would need the Ombre Builder but… after seeing all the gorgeous projects, my mind is made up. I definitely NEED it!!! Oh my! This is a great set!! Perfection! What a fun set with so many cute options! The Ombre Builder stamps are very intriguing. I like the pop of color they add. Those are really fun stamps. I like those Ombre Builder samples. Very creative. This set has so many design possibilities as demonstrated by the entire team, but one that came to mind after seeing Melissa’s 2nd card is making your own washi tape. This set really has my wheels turning – love it! Oh this look looks like such a cool set, I love the width of the different stripes. Seems like they would be easier to get straight on the acrylic blocks. Great samples! 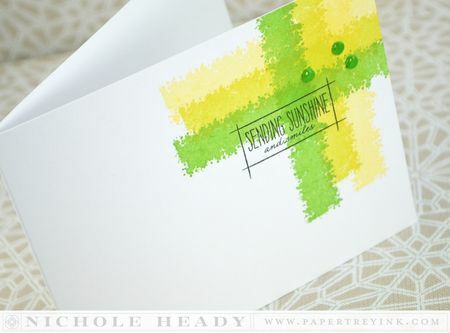 What a great way to showcase color combos with the ombré stamp set – so clever! LOVE the simple wavy lines in this set best. Lovely projects shared this morning by the PTI gals. I think this set is going to be a hit. The Design Team did wonderful projects! I am in love with the Ombre Builder!! A must for ombre stamping challenged people like me 🙂 Everyone’s cards are just beautiful. Wow, an absolutely must have set! Love the ombré cards! They will be great for CAS, one-layer cards! So many design possibilities with this set! Ombre Builder is a must have in the stash! Awesome projects by all! Ombré is one of my favorite visual effects. I often like to work it into my knitting, crochet and sewing designs. Oh wow, the ombre builder looks awesome and so flexible! This would definitely become one of my go-to sets. Another unique set from PTI! You guys are the best at designing awesome sets and showing great examples! I cannot wait for this set to be available! This is a great set, the sample cards are so much fun! I especially love the little scallop border. You continue to amaze me with all your wonderful stamps and dies. Wow…what a fabulous collection of amazing cards, this set is just incredible! Eager to see the full reveal on this one. The DT did an awesome job of showcasing a variety of uses – all very cool. Love the ombré look! Love anything ombre! thanks for the great release! WOW! Such really stunning cards. Today’s cards prove the point that real beauty can be found in utter simplicity. Thanks for sharing these beautiful creations! Ombre Builder is such a wonderfully versatile set. Surely, it will be a staple in just about everyone’s supplies. This looks like so much fun – love all the different images! I’m amazed at the variety of stamps included in this set! It looks like it will be a lot of fun to play with and get a variety of styles from just one set. The design team again, hit it out of the park! I love the Ombre Builder set, so many possibilities! Great cards and projects today Ladies! Amazing, can wait to get them! Such a fun idea – and easy also to make ombre strips!! And like all other PTI products, has many other “outside the box” options. Gotta have it!! : ) Thank you for the chance to win!! Love all the patterns. This stamp set should be fun to use. Can’t wait. oh, how cool this stamp set is! As always, Fantastic projects! As a lover of color, this looks like a beautiful way to showcase color palettes. I want to play with them right now! Love this set. so many possibilities! Wow I can’t believe the variations the designers created using the Ombre Builder set. Looks like a must have set…..amazing! Such a nice idea all these colors!! Looking forward to see the new designs. I love this set and the DT samples rock!! I love the non-traditional ways they used the set! Cute card ideas from everyone. 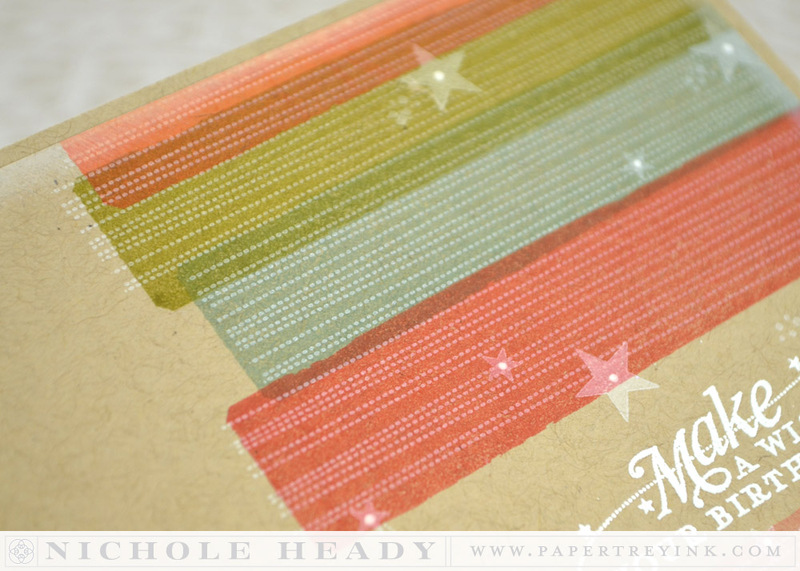 These stamps give such a beautiful effect – so many uses for them and I love a one layer card! Loving the ombre stamps and what everyone has done with them! Now, this is right up my alley. Sweet and simple. I love the ombre look, light to dark. I am not very crafty or creative – I can do this! Awesome cards. Oh my, every one of these new sets is on my list after today’s post! I am getting ready to retire and supposed to be watching my spending…not this month! Haha! Thanks a lot design team!! Oh, This is a MUST HAVE for me! So many possibilities with these! Love the ombre look and this set is awesome! A must have! LOVE the new Ombre Builder! Such a versatile set. The DT once again blows me away with their creativity. The Ombre Builder set is beautiful! Can’t wait to add it to my collection. Great samples and so many possibilities! I love all the rainbow cards with today’s ombre builder set! What a nice release. I have been organizing all my PTI stamps so I can fit more. The madness begins!!!! Love the Ombre Builder set… I love the different ways each contributor took this set.. such creativity..thanks for sharing! AHHHH ombre. These look awesome. Very on trend. Can’t wait to get my hands on them. Some great ideas. Stripes rock, especially when ombre. Wow. These cards are really great! Love all the patterned borders/stripes!! The Ombré Builders stamp set is amazing! Great projects from everyone! Really love ombré and this stamp set would be so much fun. I am imagining all kinds of projects with it. What a great idea for a stamp set!! WOW! Definitely a “go-to” basic set for all sorts of effects. A “must have”! The Ombre Builder stamp set has unlimited possibilities! I believe it will be a great stamp set to add to my collection……can’t wait to see what I can create with it! I will need to get shopping on the 15th! This an awesome stamp set (totally deserved it’s own release day!) I just love every inspiration project you and the design team have created with it! Only two more days until I can buy it!!! Squeeee! Oh, I am totally loving the Ombre Builder set! I can see all sorts of possibilities with this set, and the DT did an amazing job of showcasing it! These are great stamps, I love how all the cards came out, beautiful . Seems like such a versatile set! Great examples! What a fun clean and simple technique….love it! That will be a great stamp set to own….TFS and a chance to win! It looks like this set has many different shapes to create a variety of patterns. I love that! I’m into shades of grey, lately (nothing to do with the book). The first thing I’m going to do when I receive this set is create a grey ombre card with the triangles image. Can’t wait! You all have done it again! I love this Ombre set and all the examples presented. This set can be used so many different ways, I’d probably leave it out on my workspace. I cannot wait to order these amazing stamps. All the designers did a fabulous job of showcasing how they can be used. Thank you so much for your wonderful products. I love all things ombre! The Ombre Builder will be a great set to have. At first glance I thought I would need this stamp set but after seeing the samples I have changed my mind. Love this new (to me) design idea!!! Looking forward to seeing the Ombre set. I love what the design team has done with these new border stamps. They are so simple, but the possibilities are endless. A must have! Love these ombres that work for funeral cards to the best celebrations. Creative used as corner pieces. The Ombre Builder looks so in and fun to use! There are so many ideas running through my head! I love the possibilities in this set! Love the Ombre Builder set. On my wish list. Great projects by all. The Ombre builder will be have so many different capabilities can’t wait to use it. Love everything the team comes up with. So trendy and fun! love all the different designs you’ve created with these stamps! The ombré set is great as a background or to stamp small bits or as elements to add interest. I can see a lot of uses for this set. What a fun set! Love the Ombre look! Lots of creative, outside-the-line designs today, ladies! The design team did such a great job with the Ombre Builders set. Every card was completely different but wonderful! I wasn’t sure I needed the ombre builder set until I saw all the wonderful projects today. Great inspiration from Nichole and the design team. So I’m totally sold! What a versatile set!!! Love it. OH ombre, ombre, I am so in love with you, thanks for the wonderful inspiration!!!! Wow!! Ombre Builders is a fabulous set! I can see me using it on a lot (all?) of my cards!! So fun! I love ombre! Lots of great projects! Love the Ombre! So cool! LOVE all of the ombre – better add it to my list right NOW!!! A fun and versatile set. You are always so creative with the samples. I get excited every month to see what you come up with. Beautiful creations showcased today! I love the idea of a stamp set with so many different options for backgrounds,very exciting! Delightful ombre builders and the flowers are wonderful. I so enjoy each of the team members different use of the same stamps. Inspiring. Great product & ideas. Absolutely must have this ombre set…I mean it’s vitally necessary. No matter what. LOve, Love, Love the Ombre Builders and the Wet Paint dies. Must have both of these in my collection. BEAUTIFUL!! Love this set too!! Great projects! So many possibilities, including for masculine cards, my weakness. This is so much fun! I especially like Erin’s use of black instead of colors. I can hardly wait to see exactly what is in this set in a couple of days. Wow, can’t wait to see the full reveal of this new set! Love the DT creations. Very fun set! I like how you used it on your cards. Another great release…love the rainbow effect!? Love the Ombre, this is a staple for collection for sure. Ooooh I could so see myself using the Ombre Builder set soo much! I LOVE the new Ombre Builder stamp set! You and the DT members showed how very versatile the set is. I can’t wait to play with it myself! I never cease to be amazed at the versatility of the stamp sets demonstrated by the design team! Awesome. I LOVE ombre!! It is my favorite. The borders look like another stamp set that will be on my list. I love the Ombre Builder, great for backgrounds!! wow. So gorgeous I love the ombre builder. so many possibilities. Thank you for always including the inspiration photos. They are so beautiful. I love seeing what you create based on them! This set looks so fun. I love that there are do many choices. Love the new ombre builder and all the fabulous designs that you can create wit it. Oh OMBRE!!!!! This is going to be such a fun set to work with!!!! I just love all of the samples from the team! Love the ombré builders! What a great idea! Can’t wait to see the set in its entirety! A really cool set! Love the variations that can be done with this set. Great features from DT. Very intriguing stamps–I loved all the different ways the design team used them. I love ombré builder. It all looks so pretty! So many fun patterns…and so many options! I love versatile stamp sets. Love all the different styles of achieving an ombre look. Awesome projects. I love Ombre!! Limitless possibilities for Ombre Builders uses. Can’t wait to get Ombré Builder. I had no idea stripes and borders could be so fun and artistic. Love all the DT projects today. What a great set! WOWSA! Loving the new Ombre Builder and all the incredible things the design team did with it. Including combining it with other older sets for a wider use. Amazing talent! Most of all, found all kinds of inspiration from the Sending Sunshine card of Nichole’s. 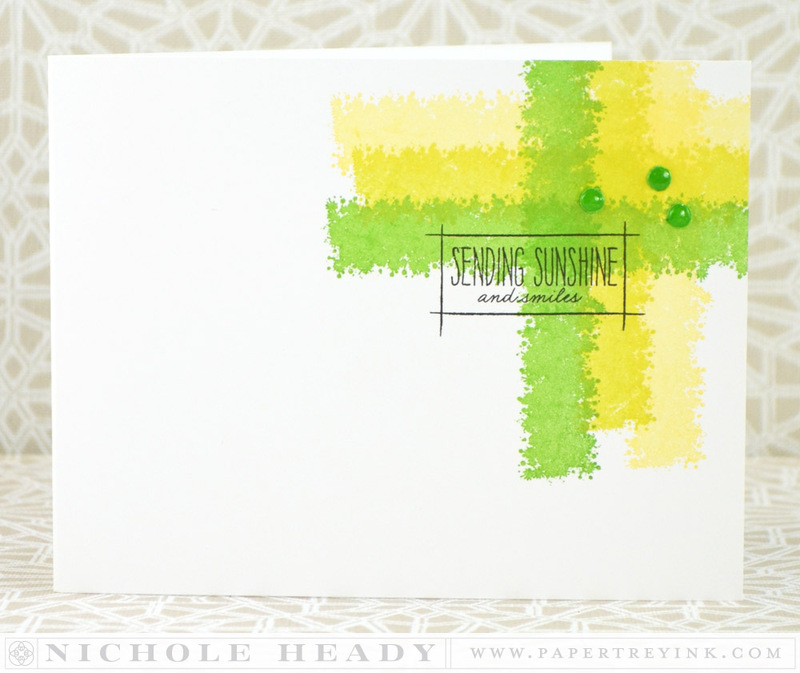 For some reason, my artist eye saw a cross in the weave, and thought it would make a stunning sympathy card….ombre builder is such a fabulous idea! You rocked it everyone!! Great samples by the DT – so many possibilities. I’m In love with this stamp set!!!! All those last minute cards just pull out this set and stamp, stamp, stamp. Then you are done! Plus all the options for using it to add rich layers is endless too! A must get set. Thank you. I love ombre. This looks like a spectacularly fun set! This is a very versatile set! Great cards from everyone today! This seems like a super versatile set! Fun projects today! Ombre Builders looks awesome–so versatile! I love all of your cards. Definitely on my wishlist! It’s getting harder and harder to decide what to buy first. Oh my! I’m in love! Great cards from EVERYONE today! You folks at Papertrey are so spot on with all of your products. Always coming out with ideas that top everyone else. Loving the ombre and adding the strings is genius! Ombre’ Builder is amazing, Nichole! But, of course, I want everything in this release…yikes! It’s so amazing to see all of the different designs with the same products. So inspiring! This was the stamp set I was most anxious to see and I wasn’t disappointed. This will be a must have for me! What a fun set! I really like what the DT has done with this set. Lovely! Love Ombre Builder!! Such awesome creations!!! Bet this set sells out fast! Gotta have it! Wow, I love it! Great set of stamps and I love what you folks have done with them! I love sets with pretty decorative elements. Love your beautiful inspiration samples! Love all of the possibilities with the Ombre Builder set!! Looks like a great set. So many wonderful patterns. absolutely gorgeous! thanks for all the inspiration. I love the look of ombre! Thanks for all the samples shown on everyone’s blogs! Fabulous cards! I’m stealing these ideas – they are wonderful! The ombre effect is beautiful. So many different options to use this new product. Can’t wait! Pretty samples. Looks like it will be easy to get this effect. Such wonderful new things to play with. I haven’t begun collecting PaperTrey. This may be the month. This set looks wonderful! So many options with this set! Wow! Really great patterns, Love the whole concept of the Ombre Builders! I am once again amazed at all the awesome projects and cards created. This new Ombre Builder is great! Anything ombre style makes me smile! Loving this ombre building set! It’s definitely a staple stamp set! 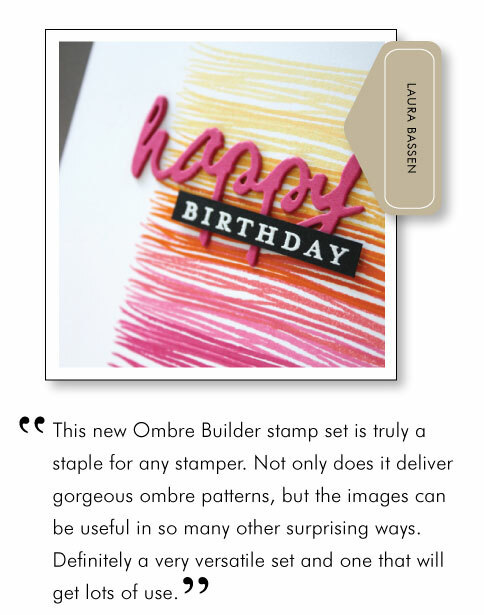 The Ombré Builder Stamp Set is an absolute staple! Can’t wait to get this stamp! The Ombre builders are definitely unique. I didn’t think that Ombre Builder would be my style at all, but have been floored by some of the gorgeous samples today. Wow! Thanks for the chance to win a gift certificate (so that Ombre Builder can be included in my order). I love this whole concept! And the tiny pixel zig zag that Dawn used may become my most used stamp of all time. Love it! You’ve, once again, given great inspirational pieces that is causing my head to pop with visions of future cards I can make. Fascinated with Ombre builder – imagine the possibilities! What a fun set – so many possibilities. Thanks for all the inspiration. Oh.my.goodness. This stamp set is soooo versatile! 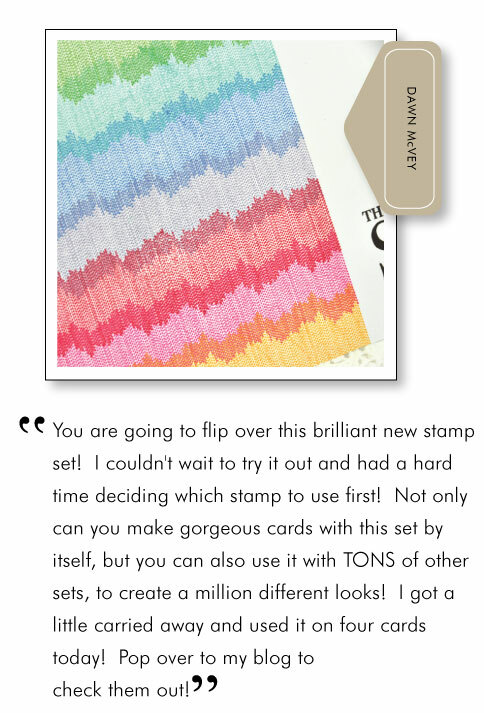 This stamp set looks like so much fun–I love all the different patterns and possibilities! 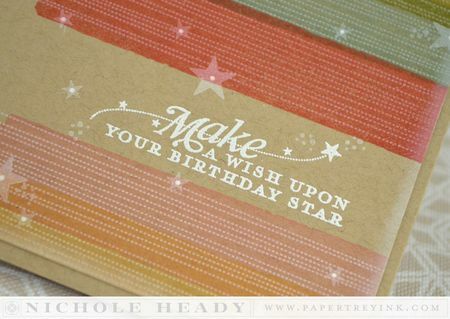 Oh wow, great to see these new ombré stamps, they’ll be so versatile to mix and match with all my other papertrey stamps! what a fun new set… very unique and creative! What a great idea for a stamp set. Love the different ombre builders. Great stamps! Love all the cards ladies. Really pretty! Love the rainbow ombre samples! So pretty!! Inspiring! Super fun must have set!! Love the ombre look! So pretty! Love the Ombre!! Looks like so much fun!! What an awesome set! Love the one strip that almost looks like linen fabric! I love what Dawn M. And Melissa did withe this new tool very different but beautiful designs. This is a really neat set, but really I adore every Papertrey set release. Keep up the creativity. The Ombre Builders is a fantastic idea! Thanks for bringing it to life! This will become a much used and very favorite stamp set! Very nice – looking forward to seeing the stamp set. Wow. Wow. Wow. Can’t wait to go check out the DT’s creations. An amazing set for those of us who love color. This is a clever set. Surprisingly, I preferred when the stamps were used in a non-ombre way. Thanks for the opportunity to win. Your cards are just beautiful as usual. Thanks for sharing all your great ideas. Ombré builder set…so versatile for sure! I love the ombre look! Your designers’ samples are wonderful!! This looks fun and fabulous. I adore Ombre Builders already. I can’t wait to play with the Ombre set! It is full of endless possibilities! 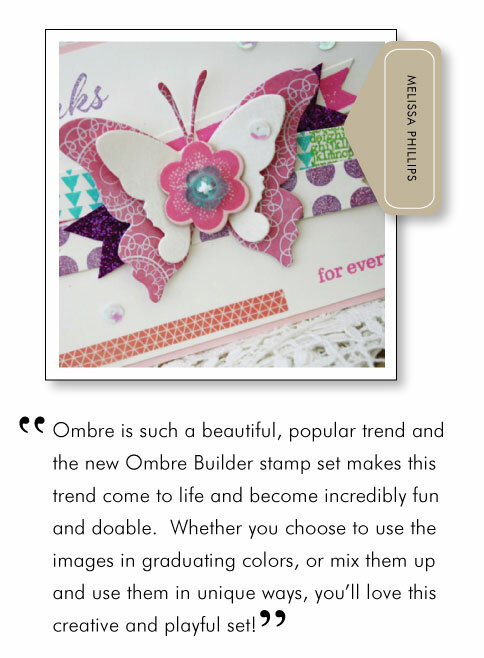 Love the new Ombre Builder stamps, can’t wait to play with them! Lots of options in this versatile set! I am so excited for ombre borders!! Will the 15th never get here?!? Wonderful card samples from one and all of the design team. Thank you for sharing. The Ombre Builder set and the Wet Paint Cuts are a great cardmaking duo. The ombre builder looks like great fun! I tend to shy away from too much color, butI think this will be a great tool! Love the different patterns in Ombre builder and how they can be used as a feature or as a great background builder – it embodies colour galore! Oh these look like fun! I love the ombre effect! Great products and projects!! What to choose??? All of this month’s release is calling my name!! The Ombre looks really great! Everybody did a wonderful job on their cards! Loving all your new stamp sets and the wonderful cards! How cool! Love this idea! Can’t wait to see the full reveal the Ombre Builder looks like a versatile little set! Great creations by everyone! Love this set! not only does this look like a great ombre set but it also looks like the perfect background builder set! Oh my Ombre Builder is SO cool and what a great way to make quick cards. Can’t wait for the full reveal! Wow!! How fun!! Love the ombre effect!! I am really looking forward to seeing what these can do! The Ombre Builder has unlimited potential! I love ombre! This set is just for me!!! Ombre Builders will definitely be added to my collection. Hugely versatile and a great way to make quick cards! Will definitely get added to my collection! Love, love, love the Ombre Builder. Another versatile set from Papertrey Ink. This is going to my cart :). Love this! Nichole and the DT knocked this out of the park! Projects are beautiful and the new products are awesome!! So very cool … love how versatile these stamps are!! I can’t wait to get my hands on this stamp set!! I love all the DT projects. What a great trend to make easier for all of us with these wonderful stamps. I love the look ombre look. The potential of the Ombre Builder are endless… Great design! The Ombre Builder set can be used in a lot of different ways even if you don’t want to do a ombre or rainbow effect. Love the ombre – what a great set! Fabulous release!! Love how many different ways everybody found to use this set. The banner looking border is so whimsical, love it. Would like to try this set using all the aquas in an ombre effect ooooh! Ombre is such a pretty look. I see lots of potential here. Wow, these are all so gorgeous. What fantastic new stamps! The Ombre Builder stamp set has my interest. I can’t wait to see the full reveal. All the projects are beautiful. What a fun idea! Love some of those border patterns. So many fantastic ideas from a classically simple set. Thank you for sharing so many wonderful projects! Love, love,, love these hombre looks!!! I love it! All of the design team samples are awesome! Patterned paper may almost be a thing of the past with these stamps! This set is a must have!! Thanks for all of the inspiration and chance to win! My head is spinning with ideas! The possibilities and versatility is endless! AMAZING projects ladies! Cool set that I can mix in with my other stamps! 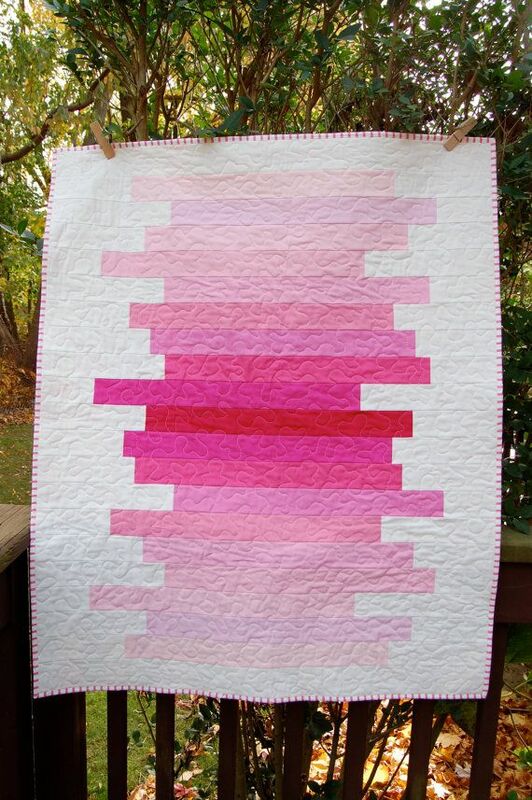 Love the Ombre Builder and the gorgeous projects! Lovely set. Endless possibilities. Love all the examples of ways to use it. Love the inspiration with these simple stamps today. Looks like a super versatile set! Thank you for the chance to win! The Ombre Builder stamp set fascinates me. I can’t wait to see it in its entirety. Great cards team! Ombré builder is such a clever design idea. Loving it! Ombré builder is a fabulous set. I will definitely be putting it in my cart! I adore this new ombre set that you designed! Will be a perfect addition to my stamping arsenal. Fabulous cards ladies! Love all the bright bold colors you used! 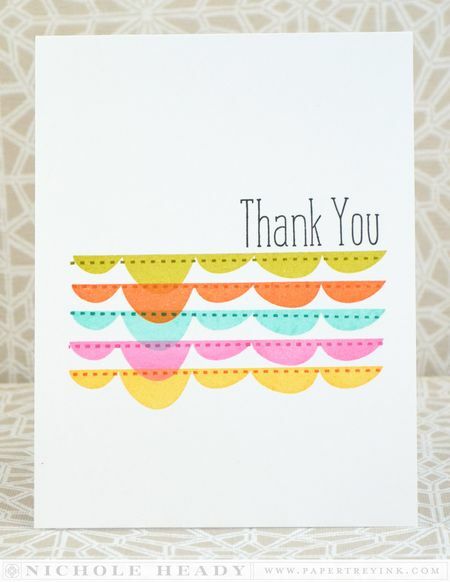 I love the simplicity of the solid stripes in your second card. That’s my favorite pattern in this stamp set. Lots of possibilities with this new set. I have already thought of several techniques I want to try. All these colors make me happy! This set is really interesting looking. The ombré look is really popular. Great samples! Oh yes! Genius! YOu have always have the best ideas! This stamp set has so much versatility. I really enjoyed looking at all the projects. Lovely ombre colors, and such unusual layouts! Great cards showcasing the new set! Thanks for the opportunity! Another great idea with ombre builders! So creative! The Ombré builder is a must have!!! Can’t wait to have that set in my hand. At first glance I thought this was interesting, but not something that I would purchase to use. After looking at all of the creative cards I’ve changed my mind! Wonderful ideas! I’m having trouble choosing a favorite! thanks to all of you for the work you do to give us ideas for our cards! 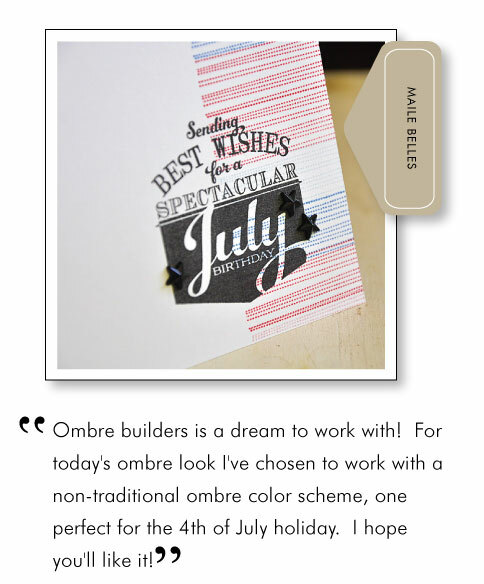 The ombré builders are incredible…such a great idea!! This ombré set looking amazing and will be able to be used often! Gorgeous ombre stamps, i particularly like the wavy edged one which looks like fine fabric and some of the girls have used it so well, overlapping it in rainbow colours. Well done all! Everything is so lovely! The cards are so gorgeous. Can’t wait to ink up the ombré builder. Thanks for the generous chance to win! Absolutely amazing set. Love the cards. The many examples from the PTI team were great! Lots of versatility in this set. I have always loved ombre, and using different patterns as well as colors is a fun twist! Great set to let your creativity go wild! So beautiful, simple enough but stunning. Ombre Builder would be a great one to have. I really love the patriotic theme throughout this release. So creative! What a great idea! And fabulous inspiration! Thanks for the opportunity! I think this is another stamp I will use for many cards. Love the ombre look. Fantastic stamp set. I’m really nosy to test it on diffrent ways, love the Ombre Builder. Looks like this will be a fun product to use. 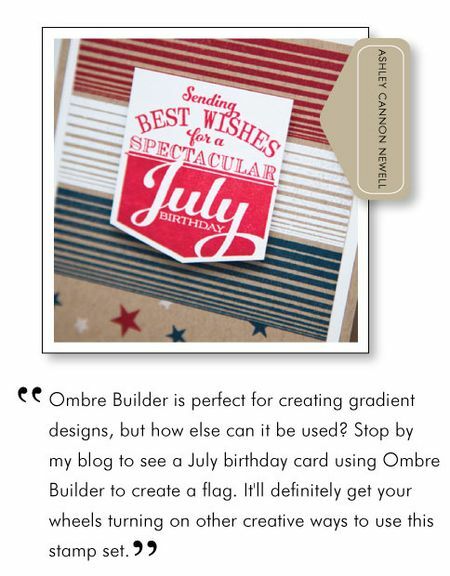 Loving the new Ombré Builders – can’t wait to get my hands on them. Thanks for the inspiration! I love stamps that I can build my own patterns with and this one looks like it has so may possibilities. I see many possibilities for this set. That Ombre set is a winner! Love the way Erin lined up the images on one block for a unique background, used black on color, and white for sentiment!! Beautiful displays today. Love how you can make a great single layer card! I just adore the ombré look and love the patterns in this set! These projects are beautiful and colorful. What a versatile set! I would never dreamed of an ombré set – so out of the box. This is why PTI is my favorite stamping company! 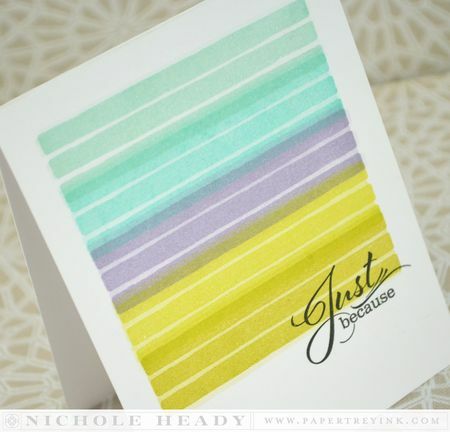 Feedburner was down so I couldn’t post yesterday, but I had to come back and say this ombre stamp set is fantastic! Woo hoo!! Love giveaways!! Especially when it comes to goodies like this!! Thanks! Wow! The creative possibilities of this stamp set are endless. I want to play with it! Possibilities are endless with these sets! Loving the ombre! The cards look fantastic! Fantastic cards and it looks so simple. Thanks. I love ombre and love all the awesome projects. love the ombre but would also would like longer ones.